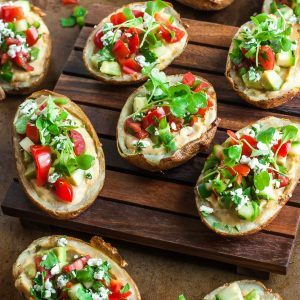 These Healthy Mediterranean Potato Skins with Roasted Garlic Hummus are healthy, delicious, and ready to party! Friends, foodies, countrymen, lend me your potatoes! I need to stuff them with hummus. Seriously!!! It’s so flipping delicious, we’re losing our minds over this recipe. 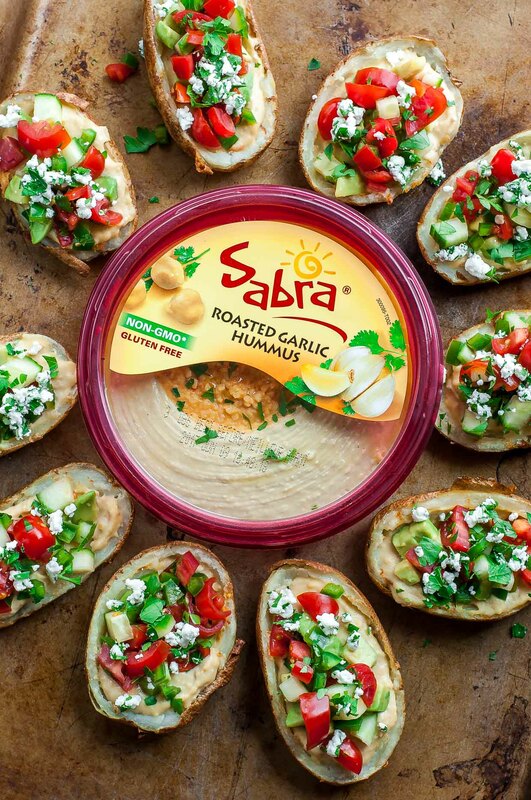 One of my favorite foodie holidays is almost among us and I’m teaming up with P&C partner Sabra to celebrate National Hummus Day in style! The official shenanigans kick off May 13th but I clearly needed to get these sassy spuds into your hands sooner than that so you can pick up everything you need to make them. Right? Right! Smile and nod, people. Smile and nod. Grab a tub of your favorite Sabra hummus and meet me in the kitchen for some plant-based deliciousness! While I passionately suggest you dive face-first into a tub of Roasted Garlic Hummus for this recipe, you can use any hummus that floats your boat! Sabra’s Lemon Twist hummus would be super dreamy as would Roasted Red Pepper. This healthy appetizer is so fun and filling that it easily could easily be an unofficial meal, perfect for that 3 pm slump that has us clamoring for a bag of greasy potato chips. Put down the chips! 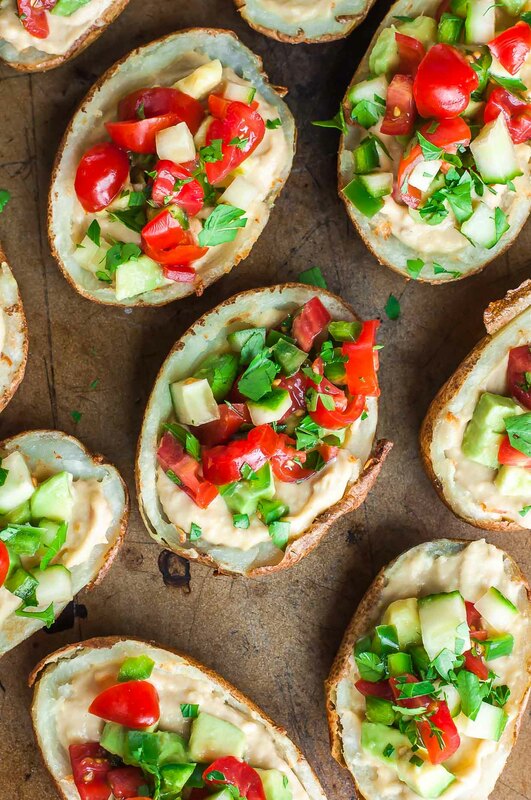 Make these healthy potato skins instead and basically win at snack-time! 1. No throwing elbows fighting over the bowl of dip. Everyone can enjoy their own personal veggie boat loaded to the brim with dip and toppings. 2. NO DOUBLE DIPPING! We all know someone is going to try it (I’m looking at you, chickpea!) so let’s just toss the bag of chips aside and dip smarter with pre-portioned bowls-o-hummus. Also? Veggies in a veggie? We’re basically wining at life here! Let’s pat ourselves on the back for this plant based deliciousness! Vegetarians :: make as written! Vegans :: skip the optional feta and your’e good to go! Wash and scrub your potatoes, and pierce each a few times with a fork or knife. Pat dry, then rub each spud with a little olive oil. Place on a baking sheet and bake for 60 minutes, until fluffy and tender inside. Allow potatoes to cool a bit, then slice each in half and scoop out the centers into a bowl. Save that fluffy goodness for some cheater mashed potatoes or another tasty recipe! Switch oven to BROIL on HIGH. Brush some olive oil on each side of the potatoes. Place potatoes skin side up on your baking sheet and sprinkle with a pinch of salt. Broil for 2-3 minutes, then flip (skin-side down) and broil for another 2-3 minutes until golden crispy. Allow to cool while you prep and chop your tomato, pepper, cucumber, and avocado. Squeeze the juice of about 1/2 a lemon over the avocado to prevent browning. You can also drizzle a little olive oil over the avocado if you'd like. I'm a big fan of this! Spread each potato skin with hummus and top with your freshly chopped veggies! Top with fresh parsley to garnish along with any other extras you'd like to add. Enjoy! To find smaller russet potatoes, look for a bag of potatoes vs. the a la carte bin of spuds. The bagged potatoes are typically smaller and perfectly sized for potato skins! Only have big ones handy? No problem! 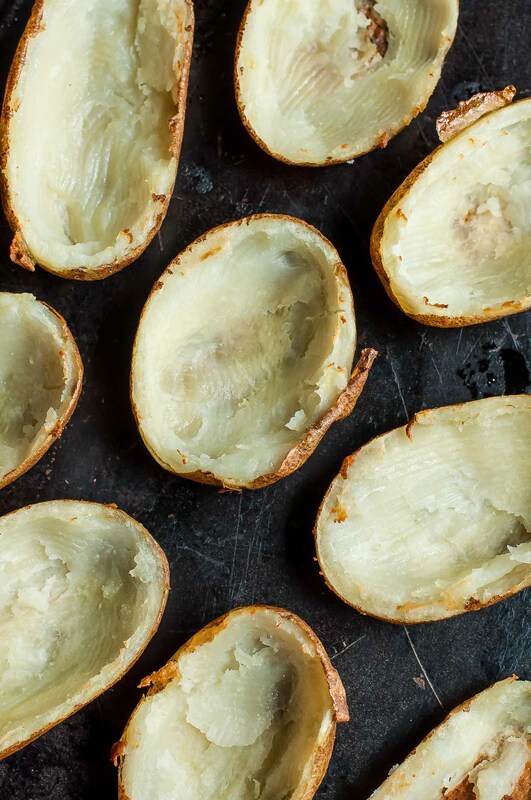 You can slice each potato skin in half before serving - easy peasy! Raise your hand if you secretly love cold French fries (I do I do I do I doooooo!) – For the sake of thorough recipe testing P and I forced ourselves to save a few of these bite-sized beauties for the following day. Though the leftover hummus potato skins lost their crispiness in the fridge they were actually still amazingly tasty chilled! I may or may not be eating one while typing this up right now. As a fun prep-ahead trick for potato skins, you can absolutely bake and hollow them in a single layer on a plate or baking sheet. (Do this plain without the hummus + veg topping; those are best added after) Transfer the frozen skins to a baggie and when you’re ready to make them, Place frozen skin in a 400 F preheated oven and bake for 10-15 minutes. Then brush each side with olive oil (butter works too if desired!) and broil each side for a few minutes until extra crispy! Stuff and serve and commence faceplant! 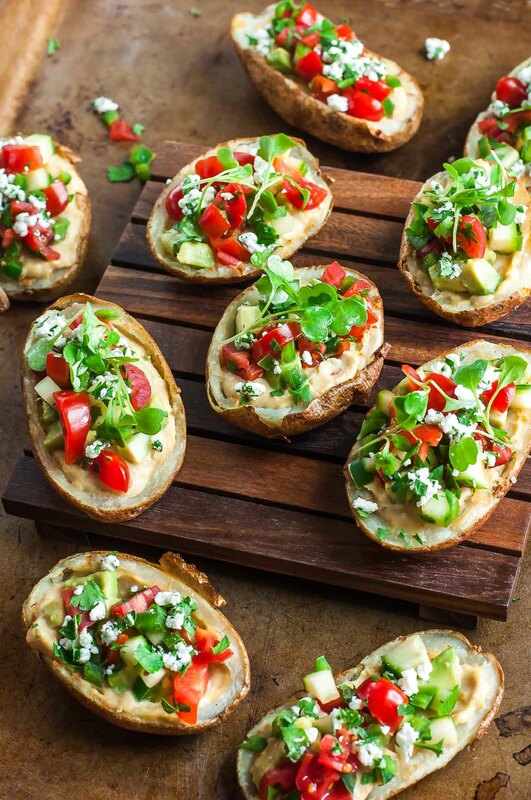 Hope you love these healthy Mediterranean potato skins as much as we do! This post is sponsored by Sabra as part of a delicious ongoing partnership. Stay tuned for more hummus spiked goodies! Hi! These look great – do you think this would work with sweet potatoes? healthy and yummy that’s what i was looking for . thanks for sharing! What a perfect little pairing! Thanks Cathy! Love them so! What a cute idea, I love hummus and potato skins! Looks like a marriage made in heaven. Love this recipe! You can never go wrong Mediterranean style! What a great idea, I love the sound of these! These look AMAZING and pshaw, appetizer? I’ll eat a whole plate of these for lunches and dinner, thanks! Really looking forward to making these soon! Oh my, those are fantastic! I love potato skins so much ! My mind is blown with this idea. You are brilliant. I want to eat them all for lunch!! Aw thank you Renee! They’d make a darn tasty lunch with a side salad or some soup – yum! I can’t wait to make these for a party! How pretty are they?! 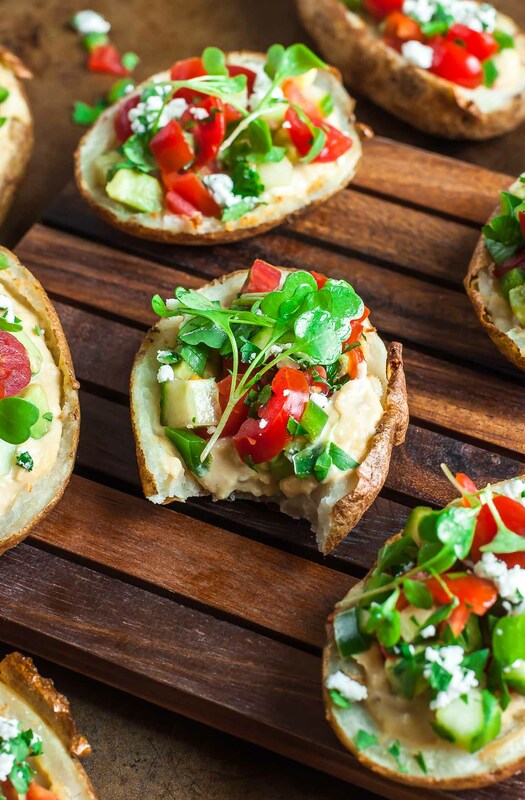 WAY better than traditional potato skins! These are absolutely gorgeous! And Sabra Roasted Garlic Hummus is my absolute favorite! You know I could eat this all day long, don’t you? Seriously. 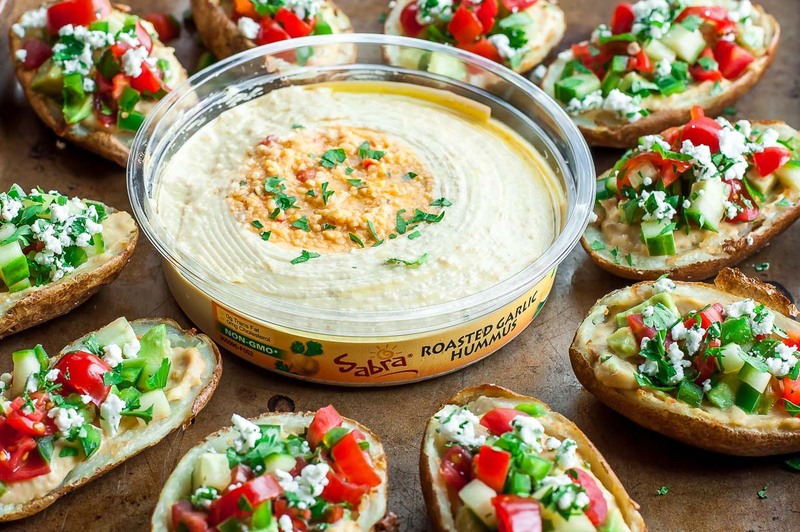 Stuffing hummus in potato skins is genius! I am obsessed with potato skins and finding new flavors for them. I love this idea, great new way to use hummus! They sound so fresh and light, yum! Can’t wait to try them out. Thank you, Kim! So excited for you to try them! Such a bright and color appetizer! It sounds perfect for the Sabra Roasted Garlic Hummus. I can’t wait to dive into these. Unbelievably yummy looking, and so healthy too. Love that they inspired you to throw a little Shakespeare into the mix. Thanks Katie! I could eat these on a regular basis – so filling and fun!